Did you know that X-Ray Magazine has permission to republish articles from #AquaCORPS Magazine? The power behind AquaCorps was Michael Menduno. He conceived and edited “the independent journal for experienced divers”, commissioning a crème da la crème stable of knowledgeable diving pioneers to write for him. The resulting prose was greedily consumed by every diver wanting to know more about the evolution of sport diving – the new and exciting movement- ‘high-tech’ diving. AquaCorps was born at a very exciting time, and it certainly greatly influenced the technical diving revolution of the late 80’s to early 90’s. (Remember the internet was very much in its infancy then). Wired Magazine described it as ‘The Sea Geek’s Bible’, and if you ever wanted confirmation of this, just talk to pretty much any technical diver of note today. 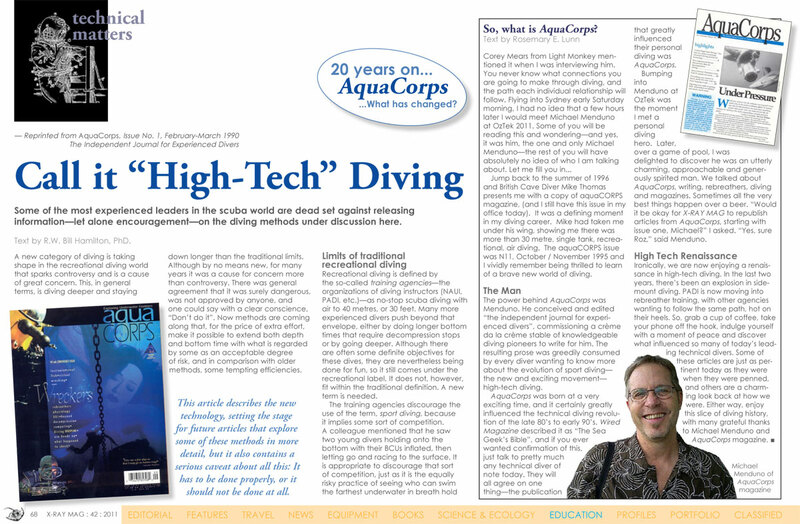 They will all agree on one thing – the publication that greatly influenced their personal diving was AquaCorps.